A pair of teenagers who ploughed a car through a garden wall before fleeing the scene are wanted by police. 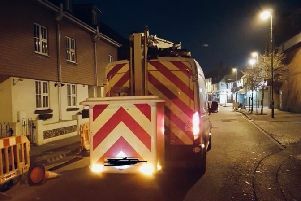 A spokesman for Sussex Police said officers received a report of a car colliding into a garden wall in Cleveland Road, Worthing, at around 9.30pm on Tuesday (February 5). It was reported that two young adults, believed to be around 18 years old and wearing dark hooded tops with their hoods up, fled from the vehicle, said police. The spokesman said officers, assisted by a dog unit, were unable to find the suspects during a search of the area. "If anyone witnessed the collision or saw the two men decamp from the vehicle please report online (https://www.sussex.police.uk/contact/af/contact-us/) or call 101 quoting 1217 of 05/02," said police. Pictures from the scene show a teal-coloured Volkswagen Golf stranded on top of the wall, surrounded by debris with its doors ajar.